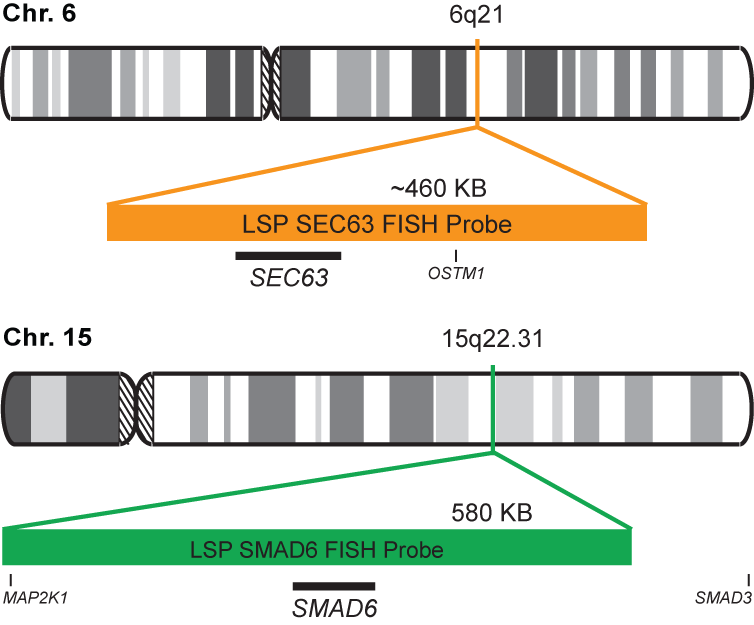 The SEC63/SMAD6 FISH Probe Kit is designed to detect the human SEC63 gene located on chromosome band 6q21, and theSMAD6 gene on chromosome band 15q22.31. Abnormal expression of the SEC63 gene – also known as ERdj2, SEC63L,DNAJC23 or PRO2507 – has been observed in lymphoid malignancies such as chronic lympocytic leukemia (CLL) and other cancers. Abnormalities in SMAD6 – also known as AOVD2, MADH6, MADH7 or HsT17432 – are associated with cardiac valve defects and developmental deficiencies. SMAD6 expression has been reported to promote cell survival in lung cancer and other tumor types. The probe is labeled with CytoOrange and CytoGreen. CytoOrange is a fluorophore with an excitation peak at 551 nm and emission peak at 575 nm, giving it an orange fluorescent signal with an appropriate filter; CytoGreen has an excitation peak at 495 nm and emission peak at 518 nm, giving it an green fluorescent signal with an appropriate filter.